Tips for Social Media Sales. 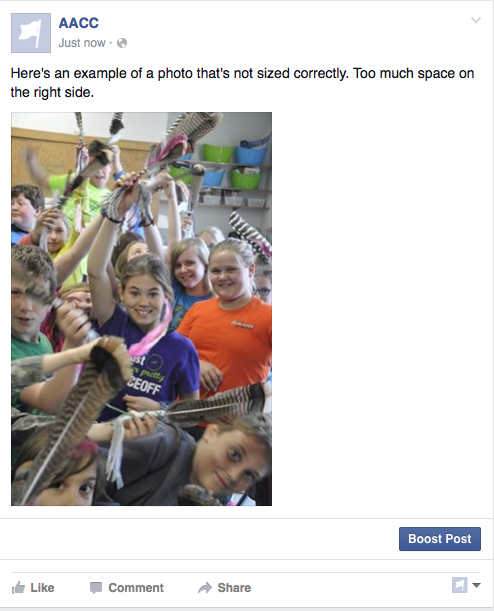 Sizing your photos and posts, linking and Google ratings. For many of us, advertising costs are out of reach. How can we sell our art without paying high prices for advertising? How can we show thousands of people our work and get them to buy it? Social Media. Facebook. YouTube. Twitter. Etsy, Pinterest. Instagram. Google+…. Are the very best free marketing tools that we have. Get on them all! Have an account at every and any social media site or business listing that you possibly can. Remember, the more your business name (keywords) is found on line, the better your ranking will be when someone ‘Googles’ you or your product. 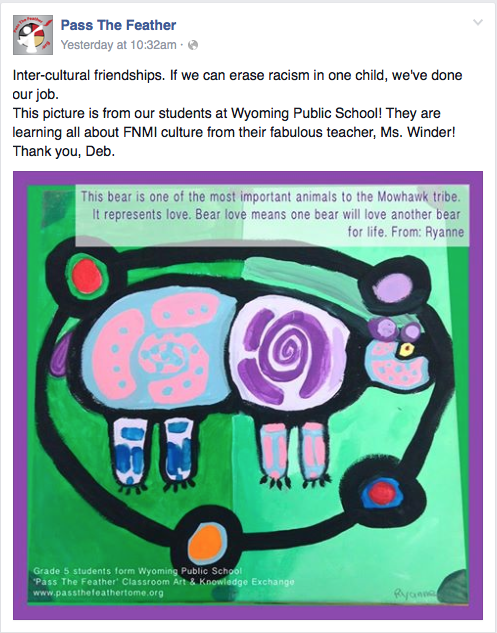 For example, if someone Googles ‘first nations art with bear’ these are keywords. Make sure that your website or Etsy site is loaded with descriptive key words for your product. Make yourself some business listings on free sites and ask your friends and associates to link to your website from theirs. It’s as simple as just having your address somewhere on their page. Even Facebook addresses work that way! A link is a link and the more places you have one, the more people will see your product. 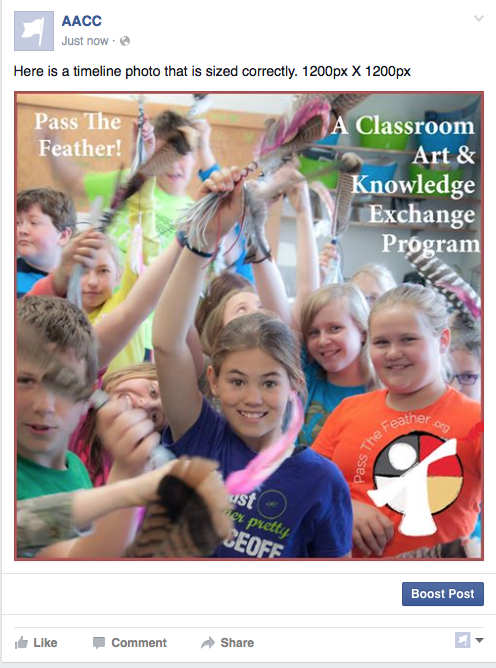 To find free art directories, just Google ‘free art directories’ or ‘artist directories’ or ‘First Nations art directory’. 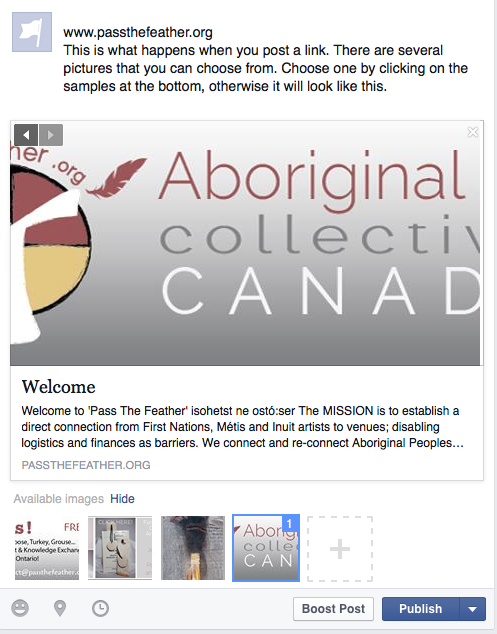 Don’t forget, in the U.S. they are still using ‘Native American’ so that is your key word for searches for people who are older, not familiar with our culture or are in the U.S.
You can start with a business page on Facebook. It will go under your personal account and you can ask people to ‘like’ your page through your personal contacts. Free. If you are persistent, your numbers will grow very quickly and more and more people will see your product. Likewise, if you post engaging information, photos or links, people will be likely to ‘share’ your posts. Imagine the reach if one person, who has 1000 Facebook friends, shares your post. There are also endless options to market your page through Facebook paid promotions and you can even put a limit on your spending so you don’t go over your budget. 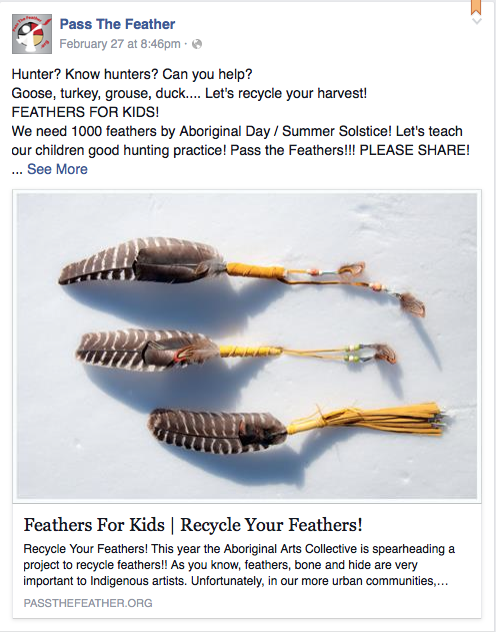 You can pick your target market (men, women, Italy, First Nations, families, pets, etc.) and even target certain geographical areas. The biggest challenge here is ‘engaging’ posts, photos and links. If your posts are boring or your photos are bad, people will skim past them– they will be overlooked. It’s really important to make sure that your timeline photos, profile photos, headers and cover photos be properly sized. You want the viewer to see both the images and text within the space provided. If your images or text are cut off or misplaced, it is possible that only a part will be seen. Imagine if you want your beautiful new painting to be seen by the world but they only find it cut off at first glance. You’re going to lose that audience. If I were to only upload my logo that has not been sized correctly, it would be cut off as it is in the first image. The second image has been carefully planned out so that the profile photo doesn’t cut off any of my images or text. Likewise, I have moved my text up so that the tabs (Learn More, Liked, Message) are not covering any of my information. Facebook is pretty great at sizing photos so that they can be seen in their entirety. Especially when you click a photo and it opens in a light-box fully sized. But at a glance, if a visitor is scrolling down your page they might miss really important posts because they don’t stand out. When posting links to websites, you will get several image choices. 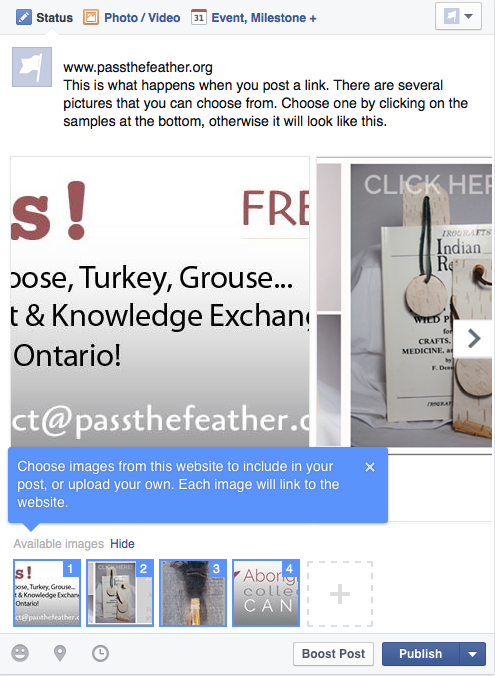 Facebook will give you an option for every image found on that page and you can ‘tack’ it to the link. But remember, website photos are not sized for Facebook and often they will get cut off. You will have to make a choice on how you want that link represented and choose the most suitable picture. You want to pick a photo that will fit the box. Website photos are in multiple sizes so it’s likely that it won’t fit. You can pick one that will represent what you want to show or sometimes you can upload your own photo. In this example, I’m talking about feathers and there is no option to upload my own photo so I’ll pick this one. You can see in this first image that the photo seems small but still does not utilize the entire space. In the second photo we have zoomed and cropped to 1200px square and it fits perfectly. 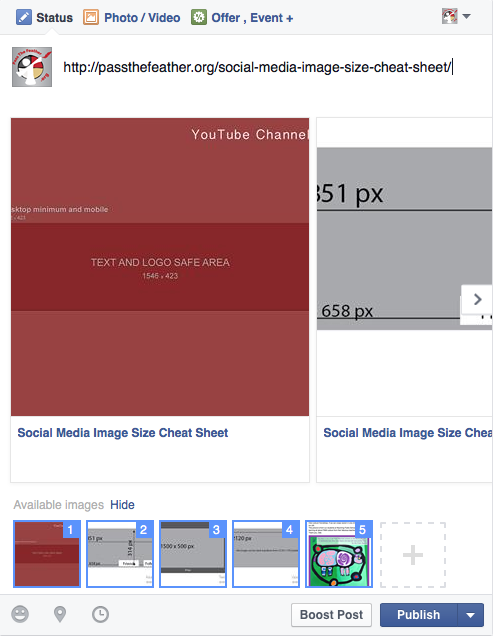 Below, I have created a few templates for popular social media websites and directories. 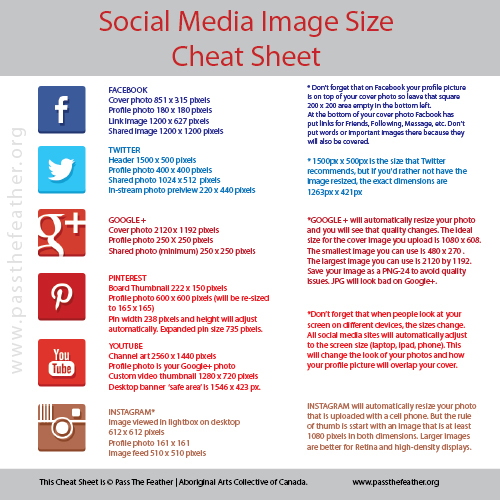 These templates will let you know the exact size that your images will need to be to appear properly on your page. If you can work with a photo editing program such as Adobe Photoshop, these templates will be very easy to follow. Photoshop is an expensive program however, and not all of us can afford it. If that’s the case for you, there are several free websites on line that will help you to size your photos correctly for certain applications. While we cannot promote those websites here, try Googling ‘photo editor for social media’. You might find a few good resources there. Additionally, some photo editing apps on our phones will have options for sizing your photos. Have a look at options there as well. Keep in mind that social media sites frequently change their photo requirements when updating. If you find that these are out of date or they’re not working for you, just look up ‘social media photo templates’ and look for the most up to date publication you can find. We have created some templates to help you design your pages. Click on any link to enlarge and right-click to download the image. To make the most of your posts, here’s a couple tips. This is a Facebook Cover Photo to demonstrate the template above. 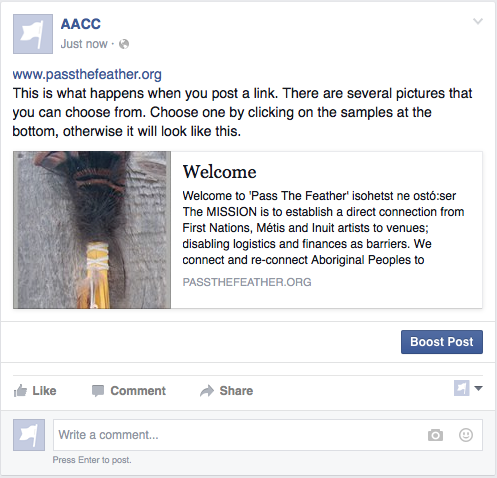 When you link on Facebook, at the bottom there is an option to post a picture with it. You can choose from what is there or you can upload a perfectly sized image (1200 x 1200px) like this one. This is a Facebook Link Photo. When you post a link there is a spot at the bottom where you can add your own photo. 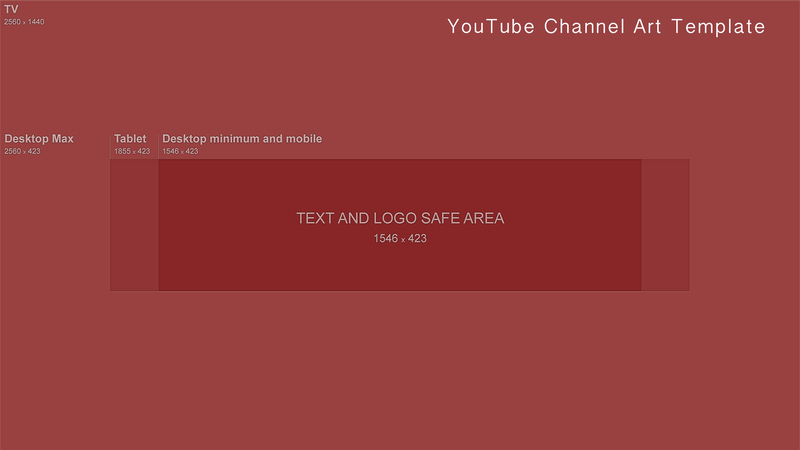 The best size to upload is 1200 x 627 pixels. Below is what it looks like when you type a link into a post. You see at the bottom you can pick a picture to profile OR you can upload one. When this happens, make sure that you un-check the ones that you don’t want. If you have a picture that is sized to 1200 x 1200, it will look better than the ones that are automatically pulled from the website. Just an image/photo that you upload. No link. This is a Facebook Shared Image photo. When you upload a picture it will fill the box completely if it is 1200 x 1200 pixels.